With over 30 years of experience and currently more than 105 car hire offices, located at major airports and tourist destinations in Spain, Portugal, Italy, France, Malta, Andorra, Morocco, Greece, Croatia, the Netherlands, United Kingdom, Romania, Cyprus, Turkey, Serbia, Iceland and Montenegro. The company offers its customers more than 60.000 vehicles that are renewed each year, making it one of the youngest rental fleets in Europe. 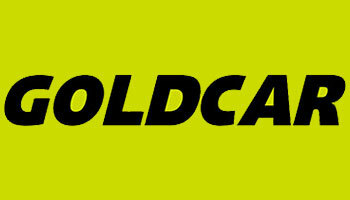 Goldcar employs a highly skilled workforce of over 1.100 professionals. Goldcar offer great prices and low season offers at Murcia plus full cover premium, roadside assistance, additional driver, internet, satellite navigation and more extras. The fleet of hire cars includes a wide range of vehicles at Murcia. Guaranteed availability of a car from the group you book with no double-booking. Goldcar have an express pick-up services at the desk and queue control via the app. Telephone helpline for roadside assistance is available 24 hours from Monday to Sunday. Goldcar have daily, short term, weekly, monthly and long term deals available, choose from a large fleet of cars, one will be best suited to your trip. A fantastic range of the most recent small and medium vehicles; hit the road in no time. Take the road with your family in one of the spacious family cars or MPVs. Comfort, convenience and quality service? You’ll get all that and more when you rent a sedan. It’s easy for you to get where you’re going – whether you have a large group or a heavy load.